Ken Sumka: From the Afternoon Drive Desk at 88Nine, I’m Ken Sumka and this is 5 Songs We Can’t Stop Listening To. 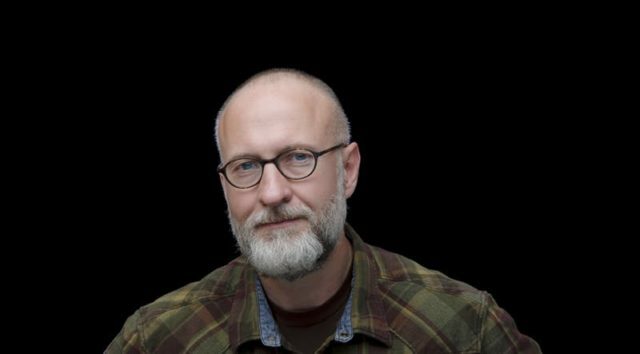 Our guest today is Bob Mould, founder of Hüsker Dü, Sugar, and a solo performer who has a new record out called “Sunshine Rock” on Merge Records. Ken Sumka: So Bob, what is one song you can’t stop listening to? Bob Mould: Oh my gosh. Well, my own record notwithstanding, it hasn’t been that long since we finished mixing it. As far as new stuff goes, I’m a long time fan of a group called Interpol. Their most recent album, titled “Marauder” is a wonderful, wonderful album and the first song I heard off of that, and it’s the song that was in my head for a while and definitely in my earbuds for a while was a song called “The Rover.” I think it was the first song that they shared with people off the new album and it really got in my head right away. I’m friends with the band and I had seen them a couple years ago and was talking with Sam, the drummer and he was telling me that he was getting ready to make this record and that they were going to be working, for the first time, with an outside producer. And he told me it was going to be David Fridmann which I was really excited to hear. When I heard, “The Rover” for the first time I was thrilled that everything worked out for them and that everything worked out for the band. Song two this week is my pick. One song I can’t stop listening to is “Jupiter 4” by Sharon Van Etten. Now I have been listening to this song a lot and I could tell you why I’d love it but I was wondering about the song so I think we should phone a friend here. Justin Barney: Hey this is Justin from 88Nine Radio Milwaukee. “Jupiter 4” was released yesterday and I’ve been obsessed with it since it came out. Sharon Van Etten: Aww thanks. Justin Barney: It’s such a sweet song, you know? “Baby baby baby I’ve been searching for you/I’ve been waiting for someone my whole life/a love so real” It is legitimately such a sweet sentiment and you would never know that unless you were listening to it. Why make it sound so dark? Sharon Van Etten: Well you know I think when people started hearing that I was going to have new music, I knew that people would think, “Oh she’s in a relationship now, she has a kid now, she’s doing all these amazing things, like this is gonna be such a happy record. I can’t wait to hear her in this light.” And as much as I love that idea—and I did write a lot you know—they’re love songs talking about my different relationships and connections with myself, but I couldn’t…I could not dismiss the the state of our world and the weight around me while feeling all these positive things. I have to acknowledge that there’s a weight around me even though I’m in a really good place. I don’t like to talk about politics in my music so much and I think we’re inundated with so much negativity right now that I know that people need a break from that in a way, but I also didn’t want to completely avoid the intensity and the darkness and this kind of, void around us with what’s happening in the real world. But being a new mother, and in love, and being in a good place you know I feel this duality and this conflict of torment knowing what I know, but also trying to be a positive influence and trying to be a guiding force and protecting my little one and making sure he feels safe. You know, there’s that duality there. I’m trying to walk the line on it, while acknowledging it, while also still celebrating my happiness, but in the context of the state of the world that we’re in. Justin Barney: That is… yeah, that makes sense. “Remind Me Tomorrow” will be released January 18, 2019. My guest this week is Leah Wellbaum, lead singer of Slothrust. Slothrust is a rock band out of Boston Massachusetts. They released a couple albums that we have played, the most recent being “The Pact” and we are playing the song “Double Down.” My guest today is Leah Wellbaum, lead singer of Slothrust. Justin Barney: What do you like about it? Leah Wellbaum: It’s super catchy and feels very like, visual to see me and and is really passionate. That whole record really sort of has this fire behind it that I’m pretty attracted to. Justin Barney: I don’t know who she is and/or what her sound is. So what does it sound like? Leah Wellbaum: She kind of has like a soulful thing going on that also like, you know, has a contemporary pop edge to it but I like that she’s made a pop record that has a real band it and real instruments. Yeah it feels like to me she’s listened to a lot of classic soul music, listened to a bunch of jazz. I know that some of the songs were co-written with Sharon Van Etten who is one of our old label mates who I also love as a songwriter. So yeah, I think the whole thing is really tight. Justin Barney: From the music desk at 88Nine Radio Milwaukee I’m Justin Barney with Marcus Doucette and this is 5 Songs We Can’t Stop Listening To. Justin Barney: Marcus what are you listening to? Marcus Doucette: I been listening to a lot of different stuff in between all the global music I like to listen to. I’ve been checking on this band out of Cleveland, They’re called Mourning [A] BLKstar. There’s like a real interesting spelling its “mourning” like mournful and “Blkstar” is spelled “B-L-K Star.” They’ve got two albums under their belt and they kind of harken back to this older era you know Sly and The Family Stone-style like funk and soul, but with kinda like hip-hop as part of their Venn Diagram. They’ve got a new album out and I really dig it. It’s called “The Garner Poems,” it’s a little bit darker and the album in fact was a tribute to both Eric Garner and Tamir Rice who were slayed by police in 2014, so it’s a little more political, but that doesn’t turn me off, that doesn’t dissuade me at all. The production is super dope, once again you find them in this particular interstices of funk, soul, and hip-hop. But it hearts back to like some old school stuff you know from like the late ’70s. It’s really like black political activism in song and in a very stylish way. I guess there are so many songs on this album that are really good, but the song that i’ve been drawn to is like right off the bat the first song from the album. Justin Barney: What is it called? Marcus Doucette: The song is called “Anti Anthem” and I’ll just let it play, it’s a good groove and I think the whole album is like that though. Isn’t that the question? It’s a question I’ve thought about a lot this year in relationships that I’ve had, and misunderstandings I’ve had of being with someone that you feel doesn’t see you for who you are. Or doesn’t like you for who you are. And I think we all want somebody to love us for who we are, and I think that’s what this song is saying. That’s why it kills me, every time I listen to it. The song “Pristine” is off of the album “Lush,” released in June of 2018.